This post is reeeal delayed, but I wanted to do a brief write-up about the last of our summer adventures since it has already turned into splitboarding season! 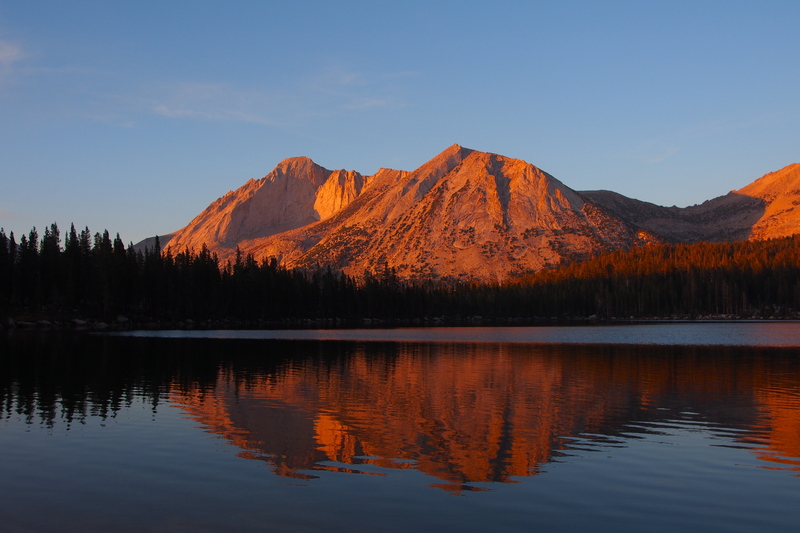 We were able to take a week off in early September so we headed out to Tuolumne and the Eastern Sierra with the goal of doing some climbing and/or backpacking, depending on what kind of permits we could get. Since we didn’t get any permits in advance, and given the intensity of the fire and smoke situation in California at that time, we kind of figured we’d be playing things a bit by ear. Friday we left work early and drove out to Yosemite, stopping just outside the west entrance of the park for a quick car-camp Friday night. Saturday we got up early and raced to the line at the Tuolumne Meadows Wilderness Center to see if we could get a backcountry permit. We were hoping for a Young Lakes permit so we could climb Mt. Conness, and we figured our chances were decent since that’s not one of the more popular areas in the park. Success! We snagged a permit and were on our way to the Young Lakes. We relaxed there Saturday night and got up early to climb the West Ridge on Sunday. We were able to get to the base of Conness just fine but had a hard time determining where the start of the West Ridge climb was located. Unfortunately we gave it little thought, assuming that the climbing would be relatively easy and that the route would quickly become more apparent. We ended up starting too far north, encountered some sketchy rock, and ended up moving further north to what looked like a more stable ridge. Several pitches later we realized that we we’re probably on the North Ridge route itself. Since we were far off route, we were moving slow and constantly assessing our situation, trying to find stable rock to climb. The day passed quickly and before we knew it, the sun was going down and we had to bust out the headlamps. Since we had not read the beta for this route, only for the West Ridge, we were surprised to encounter two rappels, but were able to get through them fine and very carefully make our way to the summit. While this was a huge and dangerous route-finding error, we were grateful that we 1) started early, 2) brought plenty of food/water, 3) brought two fully charged headlamps, and 4) that we had both brought many layers and gloves, since it was damn cold at night. After checking out the descent, we decided it looked too sketchy to attempt at night and crashed in a small cave bivy on the summit which provided excellent shelter from wind. It was obvious that many had made similar errors in the past and had used the same spot to bivy. Thankful to see the sunrise, we finally made our way back to the Young Lakes. The decent is not technically difficult, but there are sections of scrambling that are definitely in no-fall zones, so I would not recommend attempting to descend if you end up reaching the summit in the dark. Not exactly the way we hoped to climb it, but we stayed safe and learned some valuable lessons. We will certainly be paying more attention to approach details and route-finding from now on, even on popular, low grade climbs. Pretty exhausted from this all-night adventure, we took a full day to relax at the beautiful Young Lakes before heading back and venturing down to the higher Eastern Sierra. 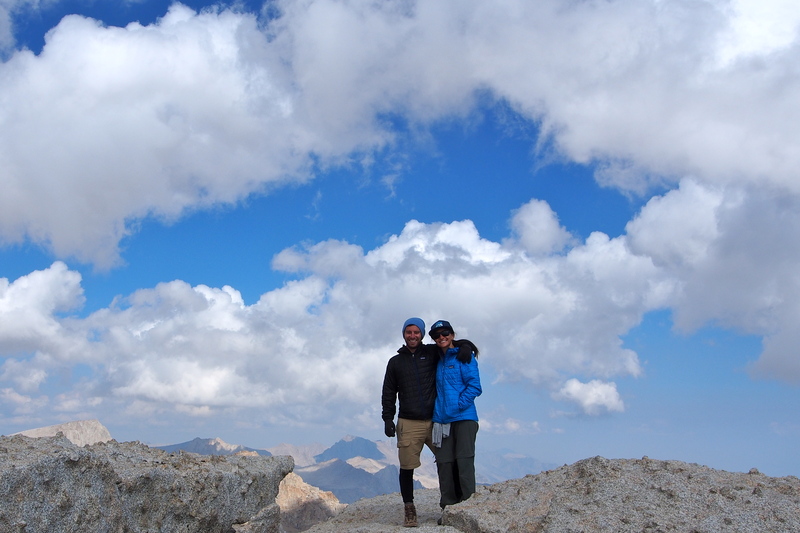 Later that week, rather than attempt the madhouse of the Mt Whitney permit lottery, after talking with the rangers, we decided to do a backpacking trip up to Mt. Langley, through the Cottonwood Lakes and Old Army Pass (although the rangers are encouraging people to take New Army Pass, we opted for Old Army since it was near the lakes where we wanted to set up camp). 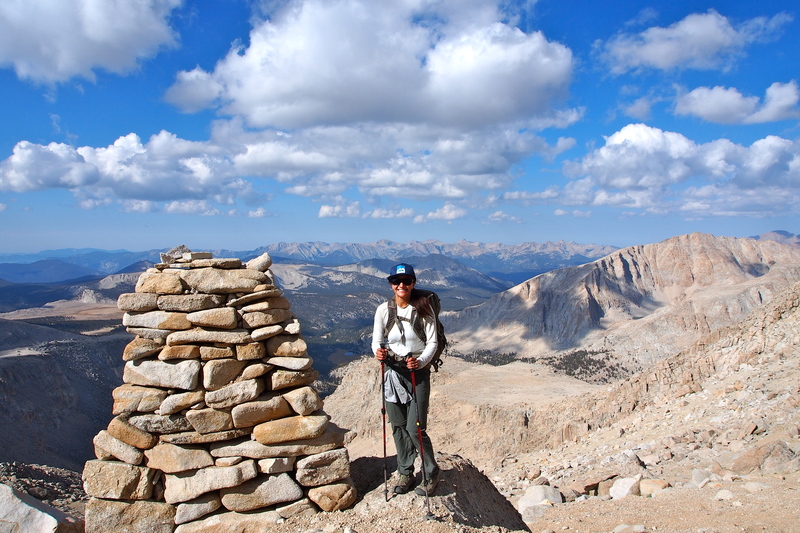 This was a fantastic backpacking trip that I would recommend to anyone, and a fun, easy way to bag a fourteener. 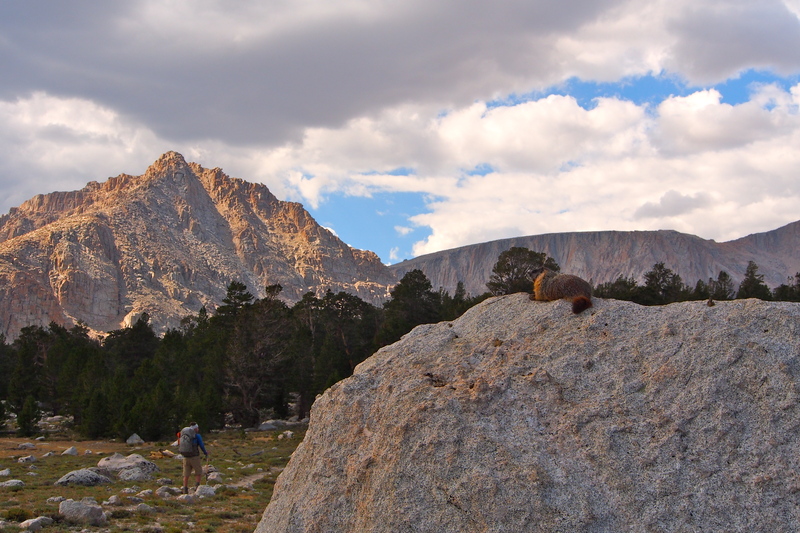 A marmot welcomed us into the Cottonwood Lakes basin. 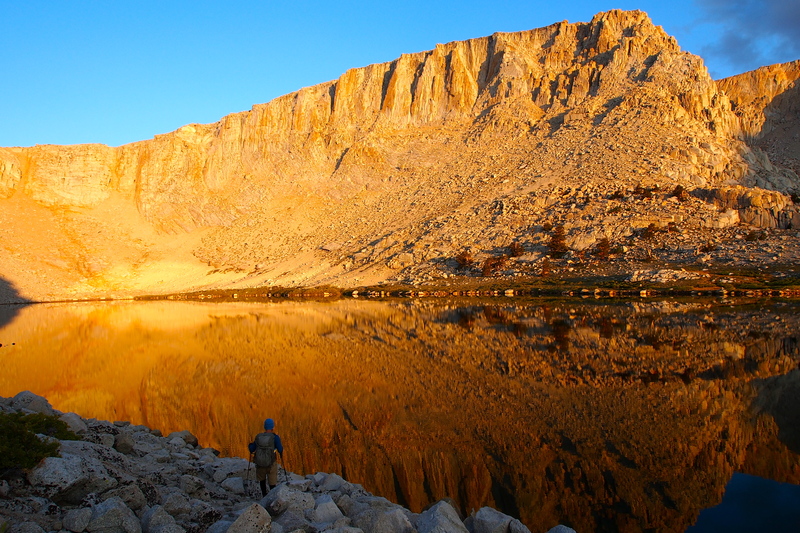 One of the upper Cottonwood Lakes just after sunrise as we headed for the summit of Langley. Old Army Pass is just to the upper left outside the view of this photo. We started at the Cottonwood Lakes trailhead, which I believe is ~10,000 ft. The hike from the TH up to the Cottonwood Lakes area was mellow and only ~6 mi or so. We set up camp at one of the lakes for the night, and there were plenty of awesome campsites available. We got up early and started up Old Army Pass to get to the summit of Langley, which is at 14,026 ft. It’s a lot of elevation gain (~4,000 ft) but a pretty easy trail that follows a series of awesome large cairns. There’s only one short section that requires a bit of scrambling. 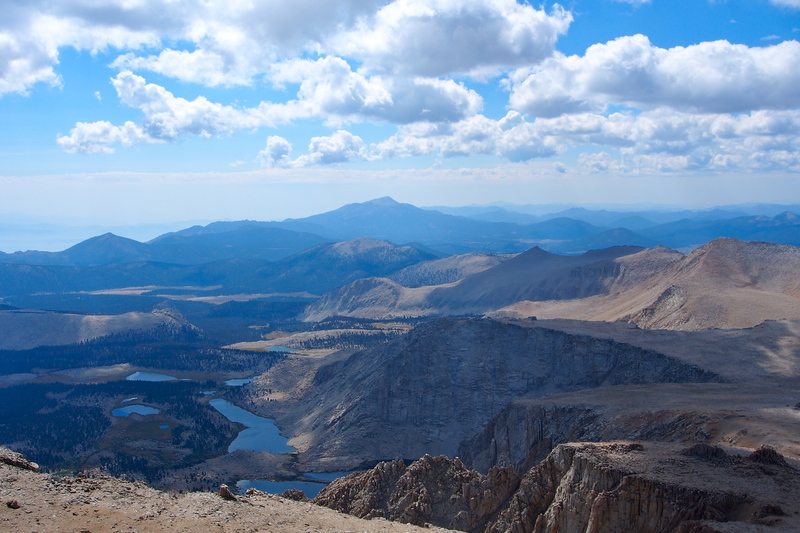 Cottonwood Lakes basin from the Langley summit. 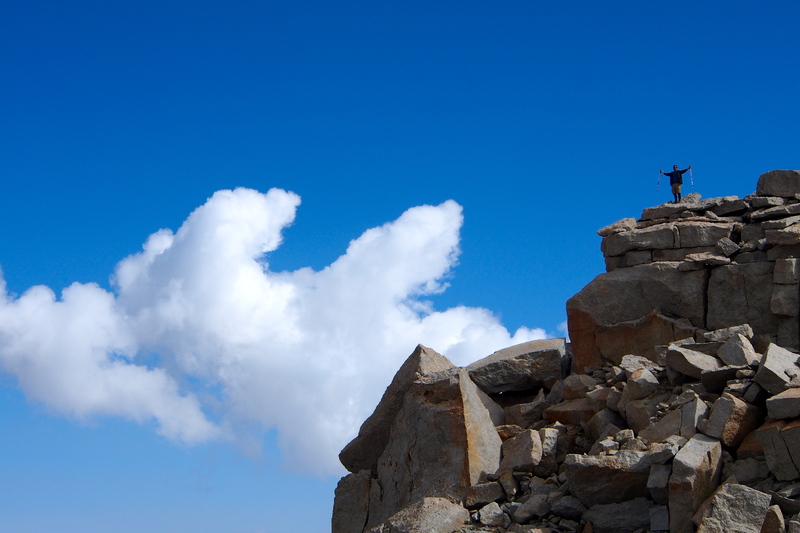 The summit offers an excellent view of Mt. Whitney and the surrounding peaks. After reaching the summit, we descended to the Cottonwood Lakes, packed up camp, and went all the way back to the car, which was a good push but not too intense. Round trip I think this hike was ~21 miles (from the Cottonwood Lakes TH to the summit of Langley and back). We spent the evening down in Lone Pine to drink in some of the local beer and culture, and then headed to Tahoe to cap off our vacation with some homies at the Wings vs. Strings festival at Squaw Valley (highly recommend!). In the weeks since, we made another trip to Yosemite, this time to the valley, where we met up with some friends and did a fun day hike from the valley up to Glacier Point, since we had yet to experience that view. It is pretty phenomenal if you don’t get too discouraged about the hundreds of tourists who drove up to the point instead of hiking… Then we ended the weekend with a fun multi-pitch climb up “After 6,” located on the Manure Pile Buttress climbing area (ha!). Easy access and a super fun 6 pitch climb. Solid trips to end a fantastic summer – now bring on the WINTER! !